This title is directed primarily towards health care professionals outside of the United States. 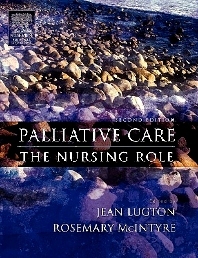 Palliative Care: The Nursing Role is an introductory text for nurses and other health care professionals who deliver palliative care across a range of settings. It lays a clear foundation of knowledge focusing on the needs and perspectives of patients and families who face the challenge of advanced, incurable illness. The style is highly accessible yet challenges readers to analyze key issues that present within palliative care. Covering the wide range of care provision in hospices, hospitals and patients' homes, the book draws widely from practice based examples to explain and expand upon theoretical issues. Research evidence underpins each of the chapters. Guided activities encourage readers to reflect, in a focused way, on their clinical experience and current practice. This new edition has been fully updated to reflect ongoing developments and shifting trends in palliative care education and practice. It will suit the needs of both pre and post-qualifying students seeking to develop their knowledge and is well suited to practitioners working within either generalist or specialist palliative care settings, or within acute or community settings as well as those studying a range of palliative care educational curricula. The authors have a wide range of experience in palliative care and all are actively engaged in practice and/or education. A clear, broad-based approach offers a thorough introduction for the non-specialist nurse. Written and edited by an experienced team of nurses working in this field, grounding it in current practice. Learning outcomes listed at the start of each chapter aid learning and comprehension. Reflective practice activities and an outline of CPD is especially useful for students working independently. Case histories, recommended reading lists, and references provide a solid evidence base for clinically based practice and facilitate further study.